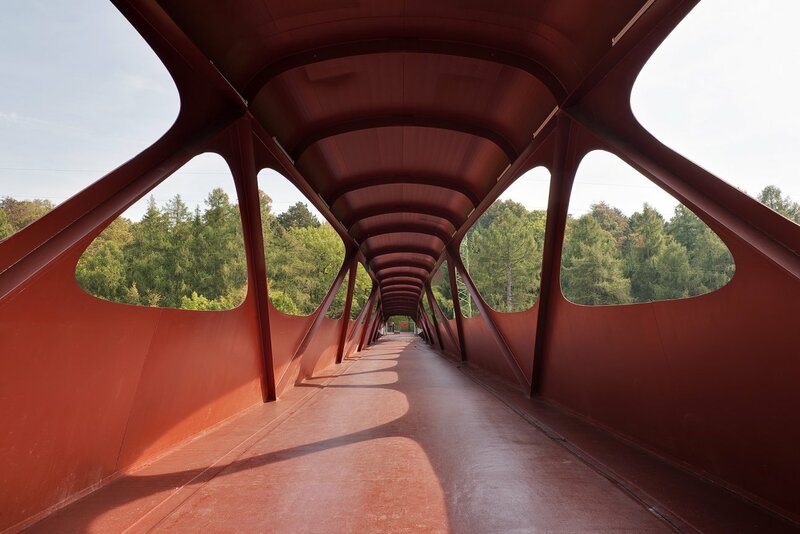 This footbridge in the city of Esch-sur-Alzette forms a direct link between the heart of the city and the green space of Parc du Galgenberg. This park is located on a hill and welcomes various activities such as sport, leisure, restaurants, but also the famous rock festival of Esch-sur-Alzette. 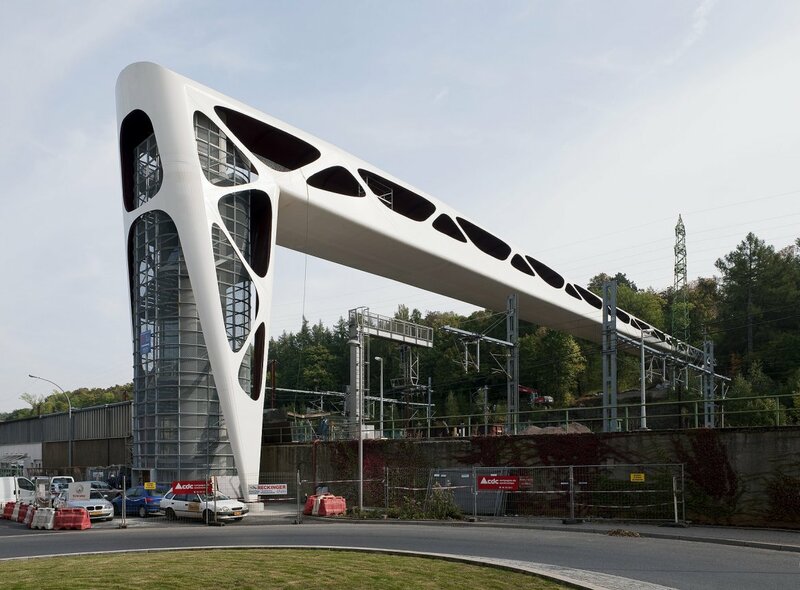 The bridge is one of the most important projects for the city of Esch-sur-Alzette as it will create change on both an urban and social level. There was no easy way to access the Parc du Galgenberg, although it is located near the city centre. It is obvious that the bridge will play an important role in the revalorization of both the city and the train station neighbourhood. In 2007 the team formed by the architects Metaform, Ney & Partners and the general contractors CDC won the Design and Build procedure with the best design and financial offer. The site conditions for the bridge are complex. Over a distance of over 110 m a height difference of 21 m needs to be dealt with. At the same time several overhead wires and high tension cables need to be avoided. The security zones surrounding the different networks, the limited accessibility of the park and the quasi impossibility to interrupt the railway service form stringent boundary conditions. The design purity is evident in the reduction of materials and elements. 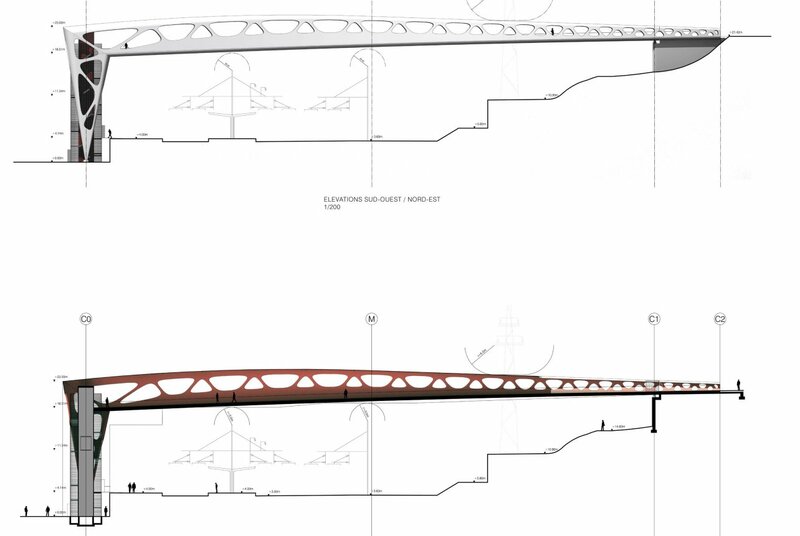 The entire bridge is conceived as a homogeneous steel skin. The exterior of this skin is painted pale greyish white, emphasizing the subtle curving of the project. The interior is painted in iron oxide red, referring to the Minette region’s characteristic red soil. This red “path” indicates the transition from the city centre to the green recreational area, and vice versa. The length of the main part is 110 m and the width varies between 5 and 7 m. In the vertical part, a concrete lift shaft allows the user to climb without effort the 21 m height difference. A spiralling steel stair is attached in cantilever at the concrete shaft. Structurally the bridge is a 3D truss beam. The steel sheet of the roof and the bridge deck form the upper and lower flanges while the diagonals are reassembled T cross-sections. All steel plates are curved. The lower plate has U-like cross-section and was filled with light weight concrete to form the bridge deck. The vertical part at the city centre side is structurally connected to the main span. The total weight of steel is 234 tons. As it was impossible to interrupt the railway traffic, it was decided at an early stage of the project to launch the bridge from a platform installed on top of the concrete lift shaft. Four temporary supports were placed between the railways and the bridge was launched in 5 phases. In this project, we have used Scia Engineer only where it was needed. Seeing the complexity of the geometry, we decided not to build a flashy full 3D model but to structure it into several efficient “local” FE-models. This allowed us to efficiently divide the work between several engineers in function of their speciality. The study of the launching process was performed in Scia Engineer with 2D beam elements. The peculiar cross section was modelled using the “general cross section module”. The internal forces in the vertical parts of the structure were also deduced from a 3D beam elements model in Scia Engineer. 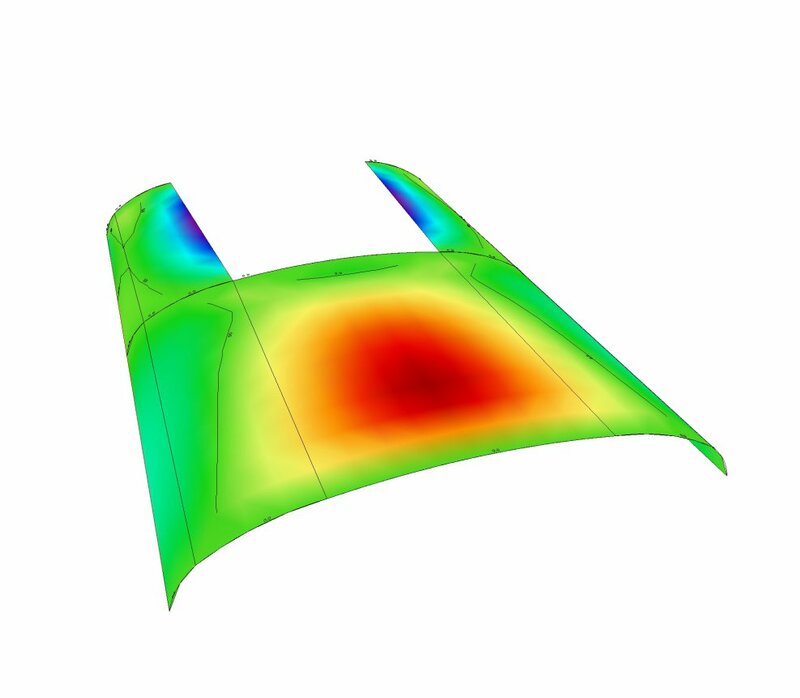 As the steel sheets were under compressive stress, a 3D plate model was used to compute the buckling stress. Other parts of the structure, such as the lift shaft and the spiralling stairs, were modelled in Scia Engineer.